In the love of your life - any one of them, for there are many, no matter what you might think - there are three people, three human beings you fall for. There is the one at the start where everything is fresh and new, which is when you see only what they want you to see; the one some time after, when the gloves come off and they show you - or stop bothering to hide, at least - whatever else they knew they contained; and the last, long after, when you've begun to see so deep into them that you can tell what they cannot. If you're lucky both of you will dovetail, fitting each other and changing in each other's perceptions as you pass through time. 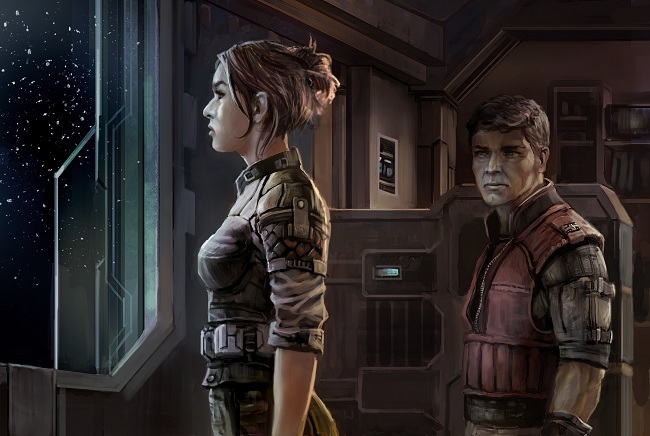 I was a Guristas operator, working out of a minor, unaligned asteroid colony in a system of really no repute at all. After years in my line of work - I was only twenty-eight but I'd started early, having developed the necessary business acumen as a teenager and had the required set of morals beaten pretty soundly into me as a child - I had come to the conclusion that nondescript, monotonous but decently populated locales were the best places to do my kind of business. Everyone here walked with their eyes to the ground and their ears clogged up with asteroid dust. Most of what I did involved oversight of nearby transactions, the kind where I linked up one person to another through channels I made damn sure were safe from prying, and acted as intermediary, facilitator or occasional pacifier, depending on the situation. 'Nearby' is even a misnomer; the distance between me and my customers was measurable in astronomical units, and I was very good at keeping tabs on the locations and movements of everyone I did business with. On occasion someone would dock at the station and request to see me in person, but I was well enough in with the local station operators that I always received plenty of warning and, if necessary, backup. I was surprised one night when a call came in over the local line to inform me that a team of allegedly Angel-affiliated operators was to dock at the station and had requested my assistance. I was free to work with anyone I liked, so long as the Guristas got their due, but people explicitly affiliated with the rank and file of other pirate factions were loath to seek out my business. When they did, it was usually out of desperate need rather than convenience. The call included verified contact details, which was normal, but also single-use encryption keys for their positions within the Angel hierarchy, which was rather out of the ordinary. I ran those and they all checked out. The group captain, a woman called Hona, was member of a special operations squad within a little-known branch of the rather extensive Angel hierarchy. It was a vague enough title and rank that I couldn't make out what her real job was, but since she was working here on the outskirts and willing to meet with nonfaction black market personnel, it was bound to be interesting. I agreed to the meeting, and as it was only Hona who wanted to see me, requested that the rest of her team be given good accommodations well away from the tumult of the mining grounds. I was always open to new business relationships, and having the clients' first memories be of sleepless nights and trembling furniture was not a good idea. We met in a local bar whose owner had considerately set up isolation booths, both aural and electrical. I arrived first and took a seat with my back to the exit - I wanted to project a comfortable, slightly trusting relaxation, and besides, if I was unsafe here of all places, it wouldn't matter which way I faced when shots got fired. I did discreetly place a small scrambler on the middle of the table; no lack of faith in the bar's isolation tech, but I also wanted to project the feeling that I knew what the hell I was doing. The beating of a tattoo on the floor told me that she had approached. From the muffled hush behind me a calm, crisp voice said my name, and I nodded in acknowledgment without turning in my chair. She walked around me and took at seat at the booth, directly facing me. There was a dominant air about her - it's been so long I can barely remember what she looked like, except that her face was set in determination as well as something else, creeping towards exhaustion. "Welcome," I said. "Drinks or anything?" "Just business," she told me. "I hope I can help." She nodded and said, "So do I," in a tone that didn't quite imply a threat so much as an inclination not to suffer idiots lightly. Humor, even in the darkest of circumstances - especially in those, really - was a major asset in any potential business partner, so I decided to test the waters a little. I shrugged and with a nonchalant air said, "If I can't, well. Shame." She shrugged in turn, and seemed to accept this. "If it's not your own fault, nothing to be done." Then she added, "If you do mislead us, of course, we'll send death squads after you," and I decided I liked her. It took a while for her to explain the particulars. The basic case was simple - undercover Angel recruitment agents had been turning up dead - but the real details lay in what they'd done thus far to find the culprit. Hona did not want me to waste time following the same tracks. As she described the precise work she'd undertaken to find the murderers, I was fascinated, first by the clear and definite purpose with which she had followed up on this - the murders had been particularly vicious and taken place in areas not safe for Angels to be in, so even recruiting people to her squad had been an undertaking - and then by the meticulous way in which she'd investigated what few leads she'd found. At some point I admitted to her that I would have a hard time improving on her work, and she took my compliments in good grace. She was charming. Presentable, assertive, in control. We got on well. As the evening wore on I found myself revealing to her a number of options that I had not even considered mentioning for the fee her superiors intended to pay me. I openly discussed, without breaking confidentiality, the extent of my connections and the abilities they lent me. She told me about life in the Angel Cartel, not only as an agent of theirs but as a regular person living on colonies under their aegis. We had drinks. We got on even better. She had signed up for the Angel service because, she said, she wanted to control the world as much as protect the people in it. Also, kick people in the teeth. I was here, I found myself saying, because it was a safe place, netted with webs of communication that I could - there was that word again - control, and yet remain at a safe distance. She understood this. She was good at talking to people, and at appearing tough enough to exercise an authority that she often did not have. We agreed on the loneliness of space. Where our careers would take us, we each admitted that we had no idea. We did not end up sleeping together. We wanted to, and so we didn't. But at the end of a long evening and a long night, we decided that she and her team would stay on station for a couple of days. We had found in each other a capable, intelligent person, and we were convinced that together we could develop a plan to root out the criminal Hona so badly wanted to find. It took a couple of days and a couple beyond that, and I had to get in touch with more people than I had expected to, but finally we acquired sufficient data to develop an extensive plan of action. It involved a series of inquiries in neighbouring space, interviews and investigations using multiple local contacts, heuristic searches through vast repositories of local data that I had access to, and a definite possibility of bringing in added manpower and weaponry in case Hona found herself outmatched by the criminals. We were going to present it to her team that evening. Then I got a note from her saying that they'd received an unexpected lead: one of the recruiting agents in a nearby constellation had lost his partner to yet another messy, horrible murder, but this time there was evidence the culprit might still be in the area. She had to go. She was sorry, but she had to go. I never answered the note. She knew where I'd be if she needed me. The next time we met she stumbled through my door covered in blood. My immediate shock was the sight of her, the poor tattered thing; quickly followed, to my shame, by a shock that she had made it all the way to my quarters without me receiving any advance warning. I didn't bother to say anything, but helped her as gently as I could to the bathroom. One of the compartments there held an assortment of healing agents, coagulants and such, including a few expensive plexiglas syringes that held different types of nanomaterial. Some of the items I had in there were expensive and even bordering on illegal, but I hadn't bothered to hide them. I'd figured that if I ever needed to access to this stuff, I couldn't expect to be in any shape or condition to burrow into any kind of secret compartments. Hona was cut and burnt all over, but the biggest immediate worry was a deep gash on her leg. It was still bleeding, so I reasoned she must've had access to some kind of basic medical help along the way - she would've bled out otherwise - and focused my attention on it. The obvious conclusion of the focus she must've possessed to reach me in particular didn't occur to me right at that moment. I sprayed her with local anaesthetic and sprayed my own hands with a sealant that formed a second skin, lest I touch the anaesthetic with my bare hands; then smeared a disinfecting coagulant into the wound. It stopped bleeding after a while, to my immense relief, and I got out the clamps. Her head was turned to one side, but I shifted a little to block the leg from view just in case. Once I'd stretched the clamps to match the wound and fixed them to the skin, they gave off a burning smell and started retracting, pulling it together and sealing it with immense local heat. It was not the most pleasant of sights - the skin blistered and dripped at the mouth of the wound - but it was a million times better than watching Hona bleed out on my bathroom floor. Once the clamps had properly sealed the skin they dissolved into the leg, where they would, at a much slower pace, continue to seal up and heal the wound underneath. I glanced up at Hona, only to find her staring right at me with unblinking eyes. Her mouth was slightly open and she was taking shallow breaths. She'd gone into shock. I gave her a little smile and stroked her cheek, then took hold of her hand and slowly stroked that as well. Whether she noticed the small patch I affixed to the inside of her wrist, I don't know, but in a few moments her breath slowed, and not too long after she drifted into sleep. She stayed with me for several weeks. Try as I might, I could not get her to tell me what had happened, other than that it had involved the murderer she'd been after. That person, she said, had been brought to justice. I sensed there was quite a bit more to it than that. She, in turn, got frustrated and then annoyed at my curiosity, and didn't hesitate to let loose when she thought I'd done enough prying. It wasn't a good time. She recovered from the initial, physical shock - her wounds healed remarkably fast given how serious they'd seemed at first and how little proper medical care she received both before and after coming to me - but there was a deeper-set trauma that neither one of us were ever able to properly deal with. It wasn't just shock; it was a nervous breakdown, something I realized the first time Hona woke up screaming and then had brought home to me when she sullenly refused, then and later, to discuss anything in her past. Not just the incident, but anything else prior: Her career with the Angels. Her past team and what had become of them. Us. She was not a woman who would allow herself to be helped. She needed it - she'd come to me, I reasoned, because I could give her a balance of safety and trust on one hand and anonymity and distance on the other - but she hated it, and I bore the brunt of her frustrations. All the sides I'd seen of her in our initial meeting came out reverted, turned in on themselves. She continually attempted to dominate our relationship, or whatever it was; in words, and in actions as well, using her secret past as excuse to go into shrieking arguments over issues of no importance whatsoever. At times she'd treat me like an underling, someone to order around. Other times she'd obsess about our safety, continually asking me about the security mechanisms in my quarters and on the station, then freaking out when she thought she perceived gaps in them. She was good at using words, and when she put up a front there was nothing I could say to pierce it, good or bad. We slept together, sometimes. We didn't always want to, but we did. Despite her intermittent worries over security, there were times when she was amazingly nonchalant about her arrival on the station. My own questions about potential repercussions or chase went unanswered outside of brief, slightly condescending comments from her that there was no risk hanging over us. When I finally did look into the records of her arrival - it took me more than two weeks to even get to that point, caught up as I was with her arrival and the change in her personality - I was astounded to find that there was no registration, no check or mark, nothing whatsoever denoting that she had even arrived in this area of space, much less crawled bleeding up to my doorstep. The anger I took in good grace. I'm sure I yelled back just as much, though that's not the point. She was changing. I could tell, easily, even though in truth I barely knew her, so I was sure she could tell, too. Sometimes, in peaceful moments, I'd see her stare out my window, at the colony outside and at the protective atmospheric shielding and the stars beyond it; and I'd see something in her face, either shifting about or, possibly, slowly settling. She was on her way to somewhere. She was shrieking because she was moving too fast, but she definitely had some manner of destination. Even with the arguments, and the petty games, and all the rest that we could never have borne for a long period of time anyway, it hurt a little that this destination couldn't be here. Why I took it, well ... I knew that I was getting to know another side of her, one she'd not have shown to many other people. Even in all the tumult, I still respected her; I saw a woman trying her hardest to deal with events that had clearly stretched her mind beyond its breaking limits. I wasn't unfamiliar with screaming arguments and fights - I'd ended up at this colony, in this job, for a reason, and even though I'd progressed far since those ugly childhood times, I still had coping mechanisms ready for use. I did get upset, as anyone would, and I did feel hurt and let down, but I retained my perspective. Besides, I knew this situation would eventually change, one way or another - for her, or for me. If I had been entirely happy with my life on the station I would likely have been more protective of it and less inclined to let Hona in. In reality, I had been growing so dissatisfied with it - especially since that initial meeting with Hona, when I'd had it hammered home just how lonely and meaningless this existence was - that I knew my own time on the colony was increasingly limited. So I kept my anger in check, allowing it to slowly rise and strengthen. I wanted to leave, sometimes, just pull up stakes and disappear, but I knew that if I dared, I would leave behind in Hona a guilt that would never be extinguished. She would think that she drove me off, and I couldn't allow that, because now matter how badly we got along - and how much I wanted her, all at the same time - I knew that this was not about me, or about us: It was, in the end, solely about her. That face, growing increasingly peaceful between the rages it was forced to express. That stare, seeing other planets. And that strange body, healed too soon from terrible damage, hidden too easily from electronic eyes. Something else, more than human. One day we woke up together. She turned to me and whispered "sorry." Then she kissed me with warm lips, open eyes, calm breathing. It tingled, and afterwards I lay in bed, stunned, more peaceful than I'd been for a very long time, far beyond her arrival in my life. I didn't hear her when she left, but I knew. I left soon after, myself, on some road of my own. When I awoke, I was in a cave, surrounded by lit torches, and there were people standing around me. I grinned at them. During the drifting it did on occasion occur to me, yes, that the one person in recent memory I'd had a different relationship with had been Hona, first because we connected through an understanding of our own loneliness, and then later when her raw, exposed, confused self was too taken up by its demons to bother with faking it from me and my own. I never reached out to her, nor made any attempt to find out what had become of her. I figured that in time, if I was meant to, I'd find out; and besides, the way the woman had covered her tracks when coming to me, there wasn't a chance I'd find her unless she wanted to leave tracks. It finally happened when I was headed through Angel space. I received an anonymous request for a meeting that ended up bringing me to a large asteroid in the middle of nowhere. Just as I was about to turn the shuttle back, it malfunctioned. First engines, then pathfinding. Then life support. The oxygen lasted amazingly long, really; I breathed easy the whole time. I knew it was her. They brought me into a city of stone, encased somewhere in the asteroid. Stalactites like cathedrals hung suspended from the ceiling. Past the center, on the outskirts, in an area where people spoke in hushed voices, there was a building - a hollowed-out stalagmite - where they led me and left me to wait alone. We talked for a while. She sounded distant; not for lack of commitment to our conversation, but as someone who now lived somewhere very far off from the rest of us. She explained to me how she had come to be there, how she'd come to terms with what she'd become and, once having reached that level of honesty with herself, had begun to be honest with the world at large. She had accumulated fellow thinkers - she did not have to call them followers; I understood what they were - and they had found themselves drawn here, to this living rock. I asked them how they got food and oxygen here, and she said the rock provided. I enquired whether they were as safe from prying eyes here as she had been after her accident, and she said the rock gave them all the protection they needed. I told her she was being maddeningly vague and she said me she didn't know what in the world I was talking about. Torches burned on every wall, casting their arcane lights on her. The people in this place, she explained, did not worship gods, but powers and universal forces, and looked to her as the conduit. She did not attempt to explain these forces and I did not ask. When I said, only partly in jest, that this made her a demigod, she looked at me for some time with the strangest smile on her face. I met her gaze and smiled back, and it took me a while to realize that whenever I blinked, I still saw her there. Somewhere in the dark of my head, where my eyes couldn't go. She asked me to turn around, and I did. She was still there. When I asked her if this was magic, she laughed, a beautiful laugh, and shook her head. I told her I was glad that she'd found the place meant for her. When she tried to shrug it off by saying it could've been anyone, I interrupted. "It's perfect for you. You're in control, you get to plan and think and care for other people, and you belong to a system greater than yourself; greater than anyone, really, given the way you've described it. I don't think I know anyone who'd fit this role so perfectly, let alone get through the initiation ritual the way you did." "You think what happened to me was a ritual?" she asked. "Not in a preordained sense," I said. "I don't believe bad things happen for a reason. But I think it brought you to a place you might not have reached otherwise. And I think you're proud of it, and of yourself. That's why you invited me here." "You think I brought you here to brag?" she said, looking immensely amused. "No, dear heart. You've no interest in acknowledgment nor compliments. You brought me here to show me you were all right," I said. "And I think you are. I think you found the end." She nodded her thanks. I stayed a little longer, but we didn't say much more. I enjoyed being with her, and she with me, and we exchanged thoughts that went beyond language. When I finally did leave, I did not need the acolytes to show me the way out. I'm still headed somewhere. Haven't quite found my way there yet. It's alright. She'll be there, however long I have to take. I still see her when I close my eyes.